President of Ukraine Petro Poroshenko proposes that each EU country prepares a targeted program of patronage over certain cities of the Ukrainian Donbas to help them revive and restore infrastructure. The President put forward a corresponding initiative during the meeting with President of the OSCE Parliamentary Assembly George Tsereteli, the press service of the Head of State reports. "The parties discussed the ways of assistance to internally displaced persons and the revival of the Ukrainian Donbas. 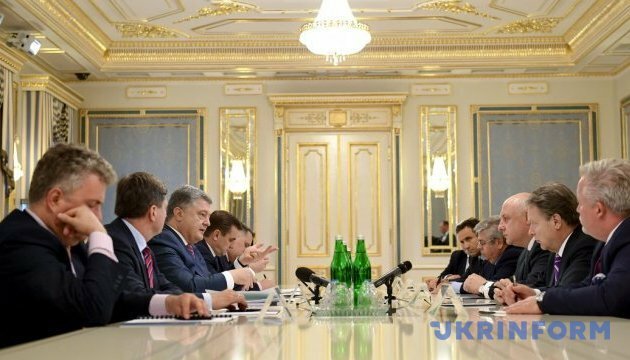 In this regard, the Head of State proposes that each EU country prepares a targeted program of patronage over certain cities of the Ukrainian Donbas, contributing to their revival and restoration of the infrastructure," the statement reads. The interlocutors discussed the security situation in Donbas and the necessary urgent steps to achieve progress in the peaceful settlement, in particular the initiative to deploy a UN peacekeeping mission in Donbas. In addition, the leaders emphasize the need to prolong the sanctions against the Russian Federation until the full restoration of Ukraine's sovereignty and territorial integrity. The Head of State called on the OSCE PA to continue efforts to release Ukrainian political prisoners from Russian prisons and Ukrainian hostages. Particular emphasis was put on the important role of the OSCE PA in the context of commemoration of the 85th anniversary of the Holodomor, in particular the recognition by the national parliaments of the Holodomor as genocide of the Ukrainian people. Poroshenko thanked the President of the OSCE PA for the support of the Assembly in the fight against Russian aggression by adopting important resolutions. George Tsereteli shared his impressions from visiting Donbas and thanked the Ukrainian delegation in the OSCE PA.